SYDNEY, AUSTRALIA – TUESDAY 20 NOVEMBER 2018 – A Stark Production, DHX Media, and Technicolor are pleased to announce that the hit series, The Deep, won Best Music for Children’s Television at the 2018 Screen Music Awards, held November 19 in Sydney, Australia. The awards, which celebrate achievements in music composition for documentaries, short films, children’s television, advertising, film and television soundtrack albums as well as feature films, are jointly presented by the Australasian Performing Right Association (APRA), Australasian Mechanical Copyright Owners – Society (AMCOS) and the Australian Guild of Screen Composers (AGSC). 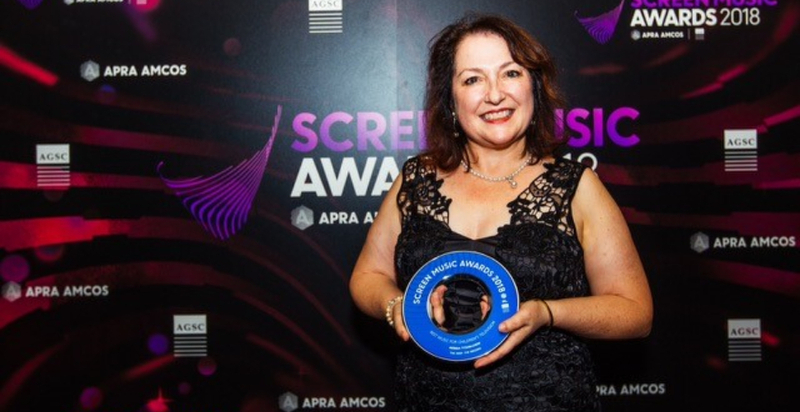 Winning for “The Missing” episode, from season two of The Deep, was Australian composer Nerida Tyson-Chew, who recently also won a Musical Excellence Award for exceptional musicianship from a female musician across any genre, in the 2018 Women in Music Awards. The Deep follows the adventures of the Nekton family—a brilliant team of underwater explorers. With state-of-the-art technology and an unquenchable thirst for discovery, the Nektons explore the mysterious depths of the ocean, where most of our world lies unexplored and unexplained. In season three, the Nektons are back and the Monumentials—huge creatures capable of changing the world—are waking from their long slumber! To put the giants back to sleep, Ant, Fontaine, Will and Kaiko must find the ancient city of Lemuria and harness its secret. Dangerous pirates, fantastic creatures and tantalizing mysteries will confront them along the way. But even with unexpected help from Jeffrey the Fish, they’re running out of time. The Deep is a global hit that has garnered numerous industry awards and accolades, including a 2018 BAFTA nomination for best International Animation, the 50th Annual AWGIE Awards in Australia for Children’s Television (5-14 years old), the 2017 Kidscreen Award for Best New Series (Kids Category) and the Golden Sparrow Award at the 2017 German Children’s Media Festival. Seasons one and two of The Deep have captured a loyal, international fan base with broadcasters and streaming services in more than 130 markets. Most recently, the new Universal Kids network in the U.S. premiered season one of The Deep in their prime 7pm time slot, and season two’s much anticipated new episodes debuted during the summer and fall of 2017 on Netflix (U.S.), ABC ME (Australia), CBBC (UK), Family CHRGD (Canada), YLE (Finland) and Biggs (Portugal). Additional broadcasters on board for season two include Super RTL (Germany), Nickelodeon (Greece), NRK Super (Norway), POP (Italy), RTBF’s OUFtivi (Belgium), MBC3 (Middle East), Minimax (CEE), KidZone TV (Baltics), Hop! (Israel), SVT (Sweden), TSR (Switzerland), SRC (French Canada), and Zap (Angola and Mozambique). The love for The Deep and its characters is also extending into consumer products and licensing initiatives, through a host of previously announced deals brokered by Technicolor, CPLG, and Super RTL. The Deep toys debuted in Fall 2018 in Germany, Austria, Switzerland, UK and Nordic countries, and quickly became Simba Toy’s bestselling boys’ property in Germany. Bloomsbury has debuted a range of books based on the series in the UK and Australia, including young fiction, an official handbook and activity-based books; and Blue-Ocean Magazines launched The Deep magazine in Germany. A larger rollout of toys, books and more is expected in spring 2019 in these territories as well as France. The Deep is a co-production between Australia-based A Stark Production (scripts, design, storyboards and music) and Canada-based DHX Media (animation, voices and post-production), with distribution also handled by DHX Media. Technicolor, underlying rights holder to The Deep, has oversight of the brand’s licensing extensions, with CPLG, a DHX Media company and one of the world’s leading licensing agencies, serving as the multi-territory licensing agent for the brand, including North America, EMEA (excluding Germany) and Latin America. The Deep was originally optioned from Nekton Productions. The television series is based on the Aurealis Award-winning graphic novel series, The Deep, which was created by multi-award-winning, best-selling comic book author and playwright Tom Taylor (All-New Wolverine, Earth 2, Superior Iron Man, Batman: Legends of the Dark Knight, Injustice: Gods Among Us, Star Wars: Blood Ties) and co-creator, artist James Brouwer (Justice League Beyond), and published by Wolfgang Bylsma and Skye Ogden’s Gestalt Comics. Robert Chandler serves as an Executive Producer on the television series, on behalf of Nekton Productions. A Stark Production (ASP) is a leader in the creative development and production of quality children’s animation and teams with global partners to deliver successful internationally co-produced shows. From its inception the company has been led by Avrill Stark, an independent and highly creative producer who has teamed with companies to produce series across a broad age range, preschool – teens. She has received many nominations and awards for outstanding animation: the prestigious UNICEF Award at Annecy, the Elan Award for Best Animated Television Production and numerous nominations for the Australian Film Industry (AFI) Awards. ASP prides itself on the development of both series and feature films with a diverse appeal both in animation and live action for children. Above all we make ‘having fun’ a priority in our pursuit of excellence! DHX Media Ltd. (TSX: DHX; NASDAQ: DHXM) is a global children’s content and brands company, recognized for such high-profile properties as Peanuts, Teletubbies, Strawberry Shortcake, Caillou, Inspector Gadget, and the acclaimed Degrassi franchise. One of the world’s foremost producers of children’s shows, DHX Media owns the world’s largest independent library of children’s content, at 13,000 half-hours. It licenses its content to broadcasters and streaming services worldwide and generates royalties through its global consumer products program. Through its subsidiary, WildBrain, DHX Media operates one of the largest networks of children’s channels on YouTube. Headquartered in Canada, DHX Media has offices worldwide.